Online sellers face higher costs going into the New Year, including eBay and Etsy commission fees that automatically increase when shipping costs rise. Amazon has also made changes to fees that take effect in mid-February, though some fees are actually decreasing. All major shipping carriers are raising rates, and the higher cost of shipping has a ripple effect for merchants who will be paying more in shipping costs to receive inventory and supplies in 2019. And because suppliers also face higher shipping costs, they may raise prices of their goods. Note that in addition to higher rates, UPS and FedEx are also raising shipping surcharges and fees. USPS rate change: January 27, 2019. In addition to rate change, USPS is also making structural changes, such as moving First Class Package Service (FCPS) to all zone-based pricing. UPS rate change: December 26, 2018 by an average of nearly 5%. FedEx rate change: January 7, 2019 by an average of nearly 5%. Sellers who offer "free shipping" to buyers will eat those higher costs. And since eBay and Etsy charge commissions on price plus shipping, sellers will pay more whether or not they pass along shipping costs to buyers. For example, the extra $1.43 for a 13-ounce package sent USPS FCPS to Zone 8 would cost an eBay seller an extra 14 cents based on a 10% commission fee, and would cost an Etsy seller an extra 7 cents in commission fees (5%). The extra 59 cents for a 15.999-ounce package would cost eBay sellers an extra 6 cents and would cost Etsy sellers an extra 3 cents. Multiply those extra commission costs by the number of packages sent, and it quickly adds up, eating into sellers' margins. The crucial takeaway: it's imperative that online merchants adjust their prices and shipping rates to account for the increased costs of doing business in 2019. @sasikat9 - I don't sell more than 100 items a day, maybe 100 items in a week, so refunding is not a problem for me. And I'm sure my buyers would appreciate my honesty. Adding $1.00 would work for some of my items, but not for all of them, so that's not a viable option for me. I just went to buy shipping supplies with my store coupon. The seller doesn't take Paypal anymore, and the seller is charging sales tax for out of state purchases. I have asked for a revised invoice without sales tax. . . .
We can thank those sellers from back in the day that did 1 cent auctions and then it was open season on what they charged in shipping. I give them credit. I want to keep my money, too. Those were the days when eBay only charged commissions on sales. It was a matter of time, as we all see now, they find creative ways to tack on fees, fees, and more fees. Hornady doesn't sell direct to customers. And the Hornady items I buy on eBay are NEW sealed in a blister pack. I guess it all depends on what you're buying. The only time I get stuff cheaper on Amazon is if I buy "returned" items, "open" box items or items that have damaged packaging. . . .
@ThisGuy - People are always stating that sellers who had an item price of $1 and $99 to ship are what made eBay add fees to shipping, but I don't believe that's true. Firstly, eBay could have suspended all those sellers for circumventing the FVFs. It's not like they've cared about sellers since JD took control, and the FVF on shipping starting in July 2011, three years after the reign of JD began. And to this day I see ridiculous shipping charges listed on some items I look at. The more reasonable explanation is eBay saw an opportunity to squeeze more money out of sellers' pockets. iheartjacksparrow says "@ThisGuy - People are always stating that sellers who had an item price of $1 and $99 to ship are what made eBay add fees to shipping, but I don't believe that's true. " It was nothing more than a money grab by eBay.. Before the fees were added eBay constantly browbeat sellers over shipping prices, even reasonable shipping prices. After they implemented their money grab you don't hear a peep out of them. eBay gets more in fees every time a shipper raises their fees. I hate paying fees on shipping but I won't take away the brilliance of the idea and the model. . . .
....now I have to go to amazon to buy a new keyboard. BTW what happened to your website? Have you put all your eggs in the ebay basket? It only had 3 sales in 2 years! Can't pay the bills with only 1 1/2 sales a year. . . .
Ill just charge every buyer the highest amount that the item can be charged, regardless of where they are at. I wont play this zone based bullcrap just because USPS turned their first class into priority and now cant afford to do so. I rather first class be 3 to 5 days like it used to be. oh well, i wont be affected, ill raise price of all items and the buyer will always pay shipping whether it says "free" or not lol of course I raise the price to cover the percentage ebay takes as well. 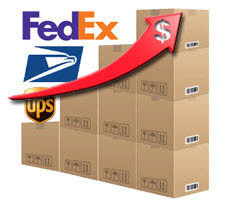 Maybe all the prices will go sjy high, decreasing usps shipments because of decreased sales and they will actually sit down like a real business and figure it out. @jack is correct as to why Ebay started the FVF on shipping. It was NOT because of those sellers that circumvented fees by inflating the shipping rates and decreasing the product price. That is just what some want you to believe so that you can blame sellers for the rate increase. It was to bring their fees more in line with other similar sites. Ebay isn't the only site that does this and it is now just how business is done on the internet for the most part now.